La Roja always looked the more likely to advance from a feisty quarter-final tie, their opponents having sneaked into the knockout rounds as one of the best third-placed finishers in the group stages. Eduardo Vargas and Arturo Vidal both had good opportunities for Chile before Uruguay were reduced to 10 men, Edison Cavani getting his marching orders with 25 minutes to go. Mauricio Isla then struck with nine minutes remaining to send the majority of the crowd in Santiago wild, and there was still time for Uruguay to lose another man after defender Jorge Fucile was sent off for a poor challenge on Alexis Sanchez. Chile had not reached the last four of the Copa America since 1991 having fallen at the quarter-final stage during the last two editions of the South American tournament. La Roja are now 1/1 to win the Copa America, while the big two, Argentina and Brazil, are 1/1 and 1/1 respectively. Chile will fancy their chances of reaching the final as they await the winner of Bolivia and Peru in the last four. Peru have been one of the Copa America's surprise packages this year, while Bolivia were hammered 5-0 by Chile in the group stages. 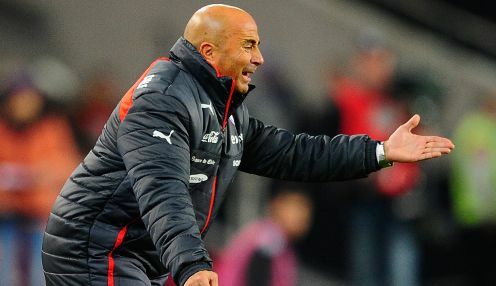 Chile coach Jorge Sampaoli believes a second meeting with Bolivia would be very different from the first and is predicting a tricky semi-final whoever they face. "We beat Bolivia when both teams had already qualified (for the knock-out stages)," Sampaoli said after his side beat Uruguay to seal a place in the last four. "If Bolivia go through it won't be the same match." When talking about Peru, Sampaoli added: "When you see them competing against teams like Brazil, Colombia and Venezuela you realize that Peruvian football is as good as any." Bolivia are 1/1 to beat Peru in the full time result market, with the Peruvians 1/1 and the draw 1/1. Don't forget, all of the fantastic markets we have to offer, including In-Play betting, can be accessed on mobile or tablet with bet365 On The Move. T & Cs apply.